Last week, 4th grade children across Tennessee complained to their parents about a question on their high-stakes TCAP test that was clearly very wrong. What was wrong? Well, we can't tell you exactly because we parents are never allowed to see the test, but we have good reason to believe our kids are telling us the truth based on the fact that many different students from different parts of the state, who don't even know each other, told their parents the same story about that question. Undeniably, where there is smoke, there is fire. We asked some 4th grade teachers about it, and they confirmed the error (without using words, of course), but no teacher would let us use her name or even her district for fear of losing her job. See, the high-stakes TCAP test is so secret that teachers are forbidden from discussing it. They will lose their job if they do. Teachers are forbidden to look at the test questions on TCAP. Administrators know of this error, too, but filing a complaint with the state over the error is a sure-fire way to get their district in hot water for tattling. Even though teachers are not supposed to look at the test questions, every single 4th grade teacher in TN saw this particular test question, and in fact was required to see this question, because it was a SAMPLE question for the Math TCAP. Before students begin the actual TCAP test, teachers have a script of directions to read aloud. The teacher reads a sample test question from the test booklet, and students then go through the process of bubbling in the correct answer so they get the hang of the test. The teacher waits as each student bubbles in an answer to the SAMPLE question, and then the teacher reads aloud the correct answer from the script. (Last week, some bright students raised their hand and told their teacher the answer was wrong, and their teachers agreed, and told their class to bubble in the correct answer). After that moment of questioning and confusion for students, the teachers started the timer and told students to begin the real test. 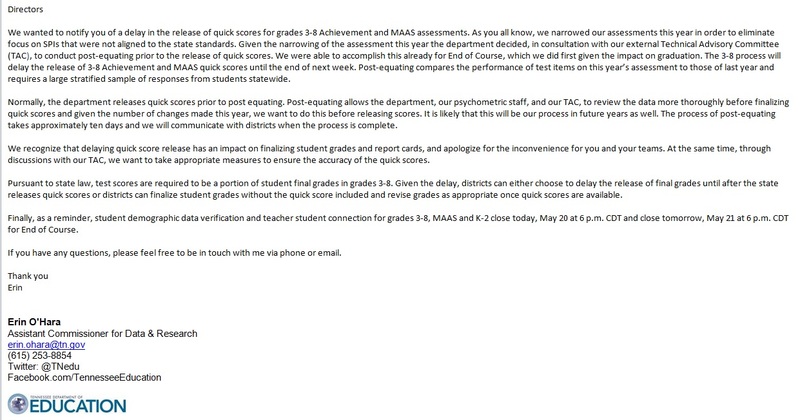 Again, we aren't really sure that our kids remember the exact question and choices after nearly 8 hours of testing last week, but all do clearly remember the teachers realizing that the test booklet, sample question, and scripted answer given were obviously wrong. This test is high-stakes. It is an albatross around students' necks. For students as young as 8 years old, the score is mandated by the State of TN to count as 15-25% of their report card grade. Their score can determine whether they pass to the next grade or not. Their score can also strangle a teacher's rating, dropping a teacher's 1-5 level through the mysterious TVAAS evaluation formula that nobody can explain. These test scores are even used to punish and close schools. "High-stakes" is an understatement! Are there more errors like this on TCAP? It is entirely possible. We will never know if there are because the test security is so tight. Parents and teachers never get to see the questions or correct answers. Maybe the Pearson Corporation will come clean and tell us. (If you believe that, TN Parents would like to sell you some stock in our new Gullible Company.) The fact is, Pearson has had many, many, many problems with its testing in the U.S.A. It is in the best interest for Pearson to keep their test security tight, to prevent parents from seeing the questions, and to require teachers & administrators to sign gag-orders preventing any discussion over the test. Teachers have also told TN Parents about the many errors in Pearson's textbooks and test prep workbooks. For the millions of American tax dollars we pay Pearson, our students should be getting error-free learning products and assessments. Wouldn't PARCC test be better? Um, hello??? Pearson does the PARCC test, too! That's like buying a different flavor potato chip. Same company, same potatoes, same quality control, same profit motive for their company. Besides, the reports from other states that gave the PARCC test this school year are horrendous. They tell of vague, confusing PARCC questions with no legitimate answer choices... frustrated students, even the brightest, advanced students in the class who weren't able to finish and who shed tears of frustration... and they mention many questions that contain advertising for brand-name products such as Nike, Apple iPod, Mug Root Beer, LEGO, and IBM. These tests and test-prep products have become a Common Core Cash Cow for Pearson, with Pearson owning the only ranch in town. Politicians: many of you insist that we must hold teachers "accountable". Why don't you hold Pearson "accountable"? *The $40-50 million that TN spent on TCAP expenses last year would have given teachers that 2% raise they were promised and deserve. The $150 million spent on testing in TN could have hired more teachers, which would truly help our children succeed more than any test ever will. Why does the British corporation, Pearson, have so much power and control over our American education system and over our children? ANSWER: $$$ to political campaigns; $$$ to lobbyists; $$$ to faux-student organizations; lavish trips for politicians and education leaders to exotic places such as Brazil, London, Singapore, and Finland; and the best tax attorneys money can buy to keep it all above-the-law.